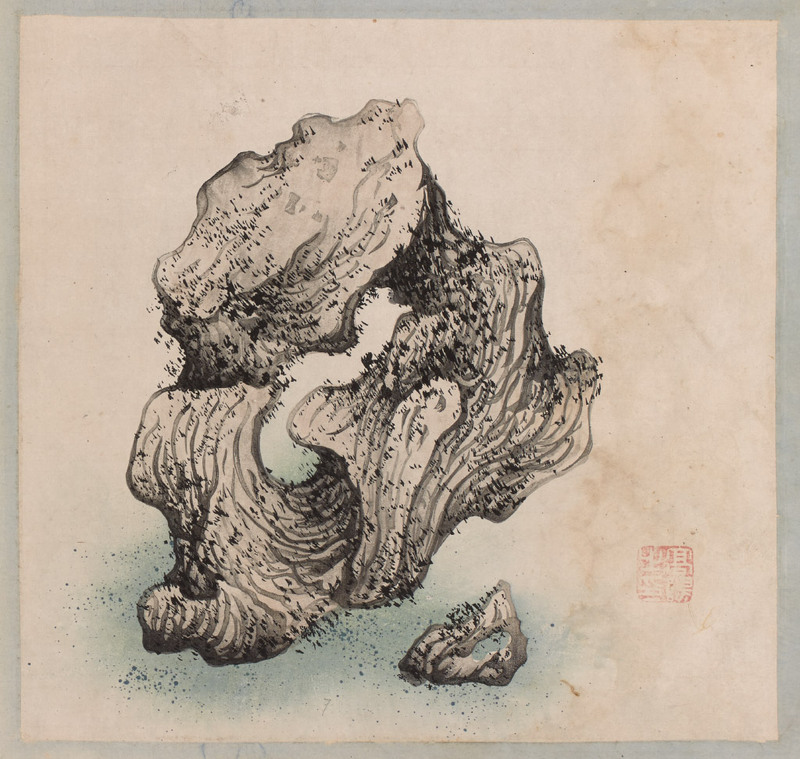 Gao Yang (Chinese, active 17th century), Mossy Rock, leaf from The Ten Bamboo Studio Collection of Calligraphy and Painting, 1633, color woodblock print, You Wei Du Zhai Collection. Many Americans are familiar with Japanese woodblock prints, which have been widely collected in the West since they were first admired by the French Impressionists. Few realize that China has an older and equally sophisticated tradition of color printing, one that evolved along a very different path. In Japan, prints developed as part of popular culture, especially the world of brothels and the kabuki theater. In China, the emphasis in color printing was on luxury goods for well-to-do intellectuals. These initially took the form of multi-volume books such as The Ten Bamboo Studio Collection of Calligraphy and Painting (1633) and The Mustard Seed Garden Manual of Painting (1679–1701), filled with the classical subjects of Chinese painting: birds, flowers, figures, and landscapes. These volumes were reprinted repeatedly and would prove enormously influential in spreading a curiously skewed knowledge of Chinese painting throughout East Asia. In the 1880s, color woodblock printing was revived to create exquisite letter papers, which were cherished by the leading literati and artists of Beijing and beyond. Drawn from the finest collection of this genre in the United States, Splashes of Color features more than 30 rare and historically important examples of books and letter papers, allowing Museum audiences to savor the full spectrum of the delights of Chinese color woodblock printing.